When the guitar-synth trigger industry was still in it's infancy, Steinberger (true to it's radical design nature) embraced the idea. In the early 80's the company partnered with Roland to offer a custom, integrated synthesizer trigger system into new instruments. The guitar version was introduced in 1985, and the bass version the year after that. 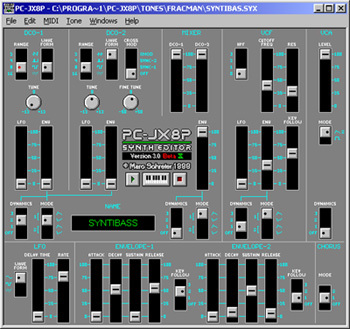 Basses are particularly difficult instruments with which to trigger synthesizers. Most guitar/bass controllers use what's called a "pitch-to-midi" (or more accurately in the older days a "pitch-to-digital") system, whereby the synth pickup senses the note being played and triggers the corresponding synth tone. This process is commonly called "tracking". For guitars tracking is usually quite good. However the lower frequencies generated by a bass means longer wavelengths, and there's often a noticeable gap as the pickup has to wait to "listen" for the entire note before precisely analyzing it. The lower the note, the longer the gap and the worse the "tracking" sounds. This is why guitars synths have remained popular through to today, yet bass versions are slim and tend to come and go. A few other manufacturers (notably Valley Arts in the 80's and the Peavey Midibass/Cyberbass in the 90's) got around this delay by installing a wired touch system within the neck itself. This system sensed which fret was being fretted on the neck, while also sensing which string was being plucked at the bridge. Combining these two readings allowed the system to determine immediately & exactly which note was being played and generate a nearly instantaneous tone from the synth. However these systems required either a specially built bass (like the Midi/CyberBass) or (in the case of Valley Arts) offering to gut an existing neck to install the wiring system. The Peavey offering was the most recent, and remained "popular" for several years but was eventually dropped - probably due to low volume sales of what is an esoteric item to begin with. The Steinberger/Roland synth kit was a factory installed pitch-to-midi system. 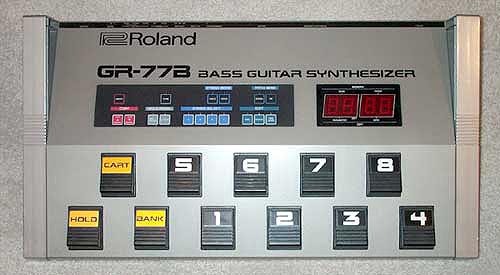 Though it was touted as a custom designed system, it was actually a variation of the same circuit found in the Roland G-77 bass also being sold at the time. You might recognize this instrument - it had a "futuristic" design with angular body, and most notably a "stabilizing" bar that ran from the upper horn of the body to the headstock. This bar was included to reduce "ghost" harmonics created by the instrument. These could be sensed by the pickup and result in unwanted triggers. Roland sold both a guitar and bass version. Though the system used pitch-to-midi, the tracking was surprisingly good. However the Roland basses themselves were somewhat heavy. Reports are they sounded OK though you'd probably switch to regular bass if not playing the synth. 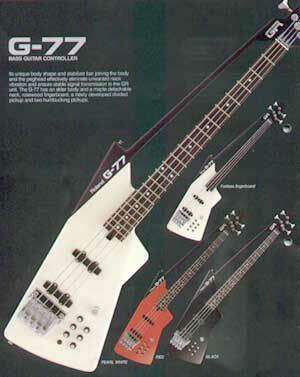 Roland only offered the G-77 for a couple years. A few synth heavy / industrial musicians still use these basses, most notably KMFDM. The first part of the signal chain is an internally installed Roland synth pickup. This special pickup has four individual pole-pieces (enclosed in the housing) which sense the notes played on each string. It's installed just in front of the bridge to minimize the harmonic effects of the string vibration and any "ghost" notes that might be triggered. You may notice the two stainless steel ends on the pickup itself. In addition to providing secure mounting of the synth pickup, these metals plates are also wired to the internal controls. This provides access to synth functions described later. The string vibration information is initially processed inside the bass itself. To compensate for action and differing volume each string has it's own gain setting. Rather than removing the faceplate, these are reached with a very small slotted screwdriver through tiny 4mm holes on the back of the bass. Bass installed synth controls. These are located on the top of the body. BAL - controls the balance of the synth / magnetic (regular direct pickup) mix. 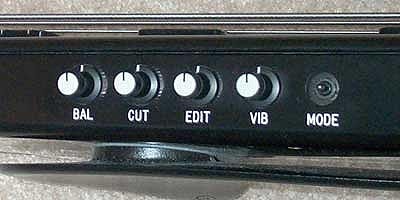 The standard bass volume control on the faceplate determines the overall gain, while this knob determines the blend of the two signals. Fully clockwise is all synth; counter-clockwise all magnetic. The middle positions give a blended sound. CUT - This controls the cut-off volume of the note. The higher the setting the sooner the note will "attack" and longer it will play. The lower the setting, the less "ghost" (unintended) notes you will hear but the harder you must play. It should be noted that most bass triggered synths (this one included) are very touchy, and require a clean playing technique to master. EDIT - This knob only works when the floorboard controller is in edit mode. It allows for parameter changes of the sound element being modified. VIB - Controls the depth of vibrato for a given sound if the floor controller is programmed for it. Touching either plate on the pickup (mentioned earlier) engages the vibrato; releasing it stops it. Clockwise setting of the knob is heavy vibrato; fully counter-clockwise functionally turns the effect off. MODE - This three position switch affects which sound is heard. 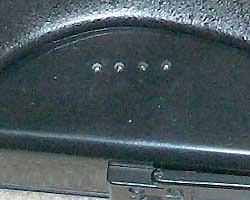 At 1 position (left), only the bass is heard and the BAL knob does not work. At 2 & 3 (right) positions direct and synth sounds can be played. On the guitar version these two blended positions have slightly different functions. **NOTE** - It's been suggested that the internals on both the guitars and basses are exactly the same. The difference lies in the pickup and floorboard controller. Considering that this MODE switch is present but the #2 & #3 settings are the same on the bass we're inclined to believe it. Once the pickup and internals process the sound, the signal is sent through a special 24 pin cable. It attaches to the bottom of the bass. . .
. . .and to the GR-77B controller at the other end. Don't let the pic below fool you - this is one hefty floorboard. The housing is approximately 28" wide x 14" long and weighs over 26 pounds! It's a decently rugged unit, but definitely one that will test your lumbar region when transporting (especially if housed in an Anvil type flight case for protection like this one is). The GR-77B is the heart of the system. It's a fully analog 4 voice polyphonic synthesizer and shares the same internals as the Roland JX-8P keyboard. The guts of both systems are identical and sounds programmed on these units are interchangeable. Specifically the JX-8P was used by a host of artists in the 80's (including Depeche Mode, The Cure, Tangerine Dream, Human League) and is still a popular vintage analog synth today. The GR-77B can store 64 sounds internally (in 8 banks of 8). Another 32 sounds can be stored and retrieved externally in proprietary Roland PC-16M memory cartridges. Surprisingly there is not a MIDI IN jack for this unit. One must remember this was in the early formation of the MIDI standard. 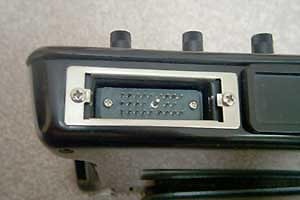 MIDI IN/OUT/THRU ports were not as ubiquitous on products as they are today. The sister JX-8P keyboard unit does possess a MIDI IN. The PG-800 external programmer is a must for tweaking this unit. This small panel enables an almost limitless change to the sounds - available all at once and in real-time. If you don't have this unit, all sound modification must be made individually though the limited controls on the floorboard and/or the EDIT knob on the bass. Every online review of these synth units (GR-77B, GR-707 guitar synth & JX-8P) stresses that to really unleash the unit an external programmer is a requirement. First off realize that this is an 80's era analog synth. If you remember songs from then, you'll instantly be transported back. Overall the pre-programmed sounds are good. The piano-like ones have a bit to be desired and there are few "out there" tones that seem worthless. It's the string, bass and pure synth tones where this unit shines. Tracking is pretty good for a pitch-to-MIDI system, though there are some patches that have noticeable lag. Setting the CUT higher on the bass, adjusting the trigger level higher (all tones default to a 50% threshold), along with tweaking the tone for quick attack helps minimize this effect. It's also possible to generate notes 1 or 2 octaves below the one you're playing. So you can set it up to generate a low E, but play the note on the D string / 2nd fret and avoid the tracking problem that way. One warning - changing the tones and/or using the PG-800 requires some knowledge of synthesizer programming. Luckily there are a number of good primers to be found on the web. In researching this unit we also stumbled upon a website that featured a custom written software based PG-800 interface. It's an older program that seems to have been originally written for Windows 3.1 and later modified for Win95 (that's still 10 years newer than the synth!) and still works fine on Windows 2000. Called PC-JX8P, it's designed specifically for the JX-8P and has the ability to edit/upload/download tones and sequences dynamically through a MIDI connection into your soundcard. I had high hopes when I found this software. I then quickly realized since the GR-77B has no MIDI in (and the programmer uses a proprietary MIDI pin connection) it was now probably useless. I decided to play around with it anyways, and noticed the site also had a large sample of tones for download. This software doesn't actually generate the tones through your soundcard, it only mimics the PG-800 controller setup. I studied the various downloads, then realized I could copy the settings manually. By loading a tone in the software then dialing the same setting in on the PG-800 in front of me (definitely the long-hand approach), I've been able to largely expand the palette of available sounds. The ones I've liked (and tweaked) have been saved to the M-16C memory cartridge. Having the external memory is a godsend. That way you can tweak the sound and be sure it's ready for callback later - without overwriting the preset internal ones. Dare I say it? This bass is a blast. For some reason it just seems way cool to play (insert band name here) synth bass lines actually on a bass. And on a Steinberger no less. From a practical standpoint I'd have to admit a keyboard synth is easier and definitely makes more sense in a studio environment. Maybe even live too. But it'd be fun to watch the audience try and find where the keyboard player is at. Though I'd love to, I would hesitate to gig regularly with this setup. It's seems pretty durable, but I'm unsure of it's long-term "roadworthiness" and would hate to be its downfall after surviving for 15 years. I would cringe if anything was broken and/or stolen. Each part of this setup would require expert knowledge to repair (and we know that always costs $$) if it's even possible to do. Small things like the custom 24 pin instrument cable costs $200 now because they are so hard to find. Roland sold the last new ones at least 10 years ago. I have seen the GR-77B floor units and the PG-800's for sale on eBay from time to time. The floorboards are mostly seen with other gear (usually a Roland G-77 bass); occasionally without. 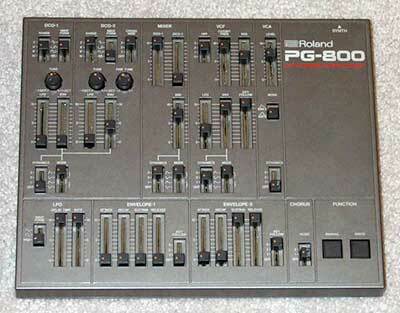 The PG-800's are much more common, since they were used with several synths. So working replacements of each would be possible to obtain if you're patient. These units are extremely rare. 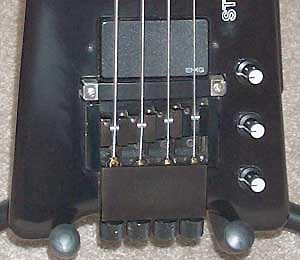 Estimates are perhaps 75-100 of the GL2(T)-GR's were produced, but less than ten of these bass units. We're aware of the ownership of several others (including two damaged ones) and Roland stopped supporting the product well over a decade ago. The original owner of the one you see pictured above actually bought it as a replacement for a stolen G-77. Roland told him they had stopped making their version and had none in stock. His friend happened to see this model in a Steinberger catalog, so he called the factory. Though Steinberger had stopped making them as well they still had two sitting on a shelf in Newburgh. Luckily for him he had replacement insurance and he bought the bass directly from the factory. Since they are so rare, resale prices are hard determine. The bass itself listed for over $2400 new, and the floorboard synth was another $1995. A complete working setup (an XL2-GR bass, a GR-77B floorboard synth, a PG-800 programmer & all cables) could easily fetch $2000 in today's market. **NOTE** - After years of not offering a bass synth/trigger system, Roland introduced the GK-2B pickup and V-Bass modeling system exclusively for bass in early 2002. It's designed as retrofit system on current instruments and is a modified version of their popular GK-2A & VG-88 guitar systems. It should be noted that the V-Bass is not a true synth, as it is doing waveform modeling and not true synth tone generation. However for many bassists it's "good enough".